What is a Spirit Guide? A spirit guide is a soul or Being who exists in the spiritual realms, and whose purpose is to support you on your journey through life. Your spirit guides are your spiritual mentors, protectors, helpers or companions. They are there to support, love and assist you. You may be connected with a spirit guide through having known them in a previous incarnation, or they may have specific, excellent skills that can help you. Does everyone have a Spirit Guide? Yes, everyone has a spirit guide. There are no exceptions. Do I have More than One Spirit Guide? Yes, everyone has several spirit guides. Some guides are unique to you, others will be helping other people as well (think of angels, the Ascended Masters (Jesus, Merlin, Mary Magdalene, etc). Each guide is with you for a different reason. You have a main guide who understands your purpose in life and why you are here on planet Earth at this time. And you will have other guides who come in and out of your life at difference times to support you through the various phases, challenges and events you experience. Your Main Guide, also known as your Gatekeeper, is one who will be with you throughout your entire life. Before you were born you had decided what you were going to experience and learn during this lifetime. Soul mates, souls you have known for many lifetimes, may also be reincarnated at this time to assist you with these experiences. You will know which human being you will be and will choose your parents carefully. You will understand how the stage upon which your life will be played is set out. These things you will have discussed with your Main Guide because this will be your purpose in this lifetime. When you are born, all memories of these discussions with your main guide are erased. It is as if before you were born you had a map, detailing all the directions you could take in order to achieve your purpose. Upon your entry into the world, the map is taken away. Your Main Guide holds this map for you and, along with other guides, will help to keep you on the paths or paths you have chosen. You will meet your Main Guide again when this life is done. You could think of your main guide as your mentor. Do my Spirit Guides Change during my Life? Yes, as you evolve and mature spiritually and as your circumstances change, your guides will change too. Each of the guides that come to support you will bring a specific skill or set of skills that can benefit you at particular times in your life. Depending on the circumstances, a spirit guide may be with you for a few days, weeks, months or years. Your Gatekeeper though, is always with you. You knew your Gatekeeper before you were born; they with you when you were born and they will be there to greet you when you eventually rejoin the spirit world. Can a Relative be my Spirit Guide? Yes. So many people have told me that they sense their beloved grandparent around them. Others mention that they can smell the scent of a particular flower they associate with their grandmother, or a particular tobacco their Grandfather used to smoke. Two of my sisters saw our grandmother’s spirit sitting at the foot of their beds. Nanna only visited when there was a sick child in the house and she would stay until the little one’s health returned. Why are there so many Native American Indian Spirit Guides? Native American Indians led a spiritual life in every sense. Their lifestyle was atuned to their environment. They appreciated the ground they walked on, nature in all forms and were thankful for these gifts. Many Native Americans spent hours a day in meditation, communicating with Great Spirit. Geronimo, whom I had the great privilege of channelling (see right), being a famous example. Native Americans evolved great wisdom during their earth lives in addition to their spiritual practices and comprehension. This alone makes them highly qualified as spirit guides. 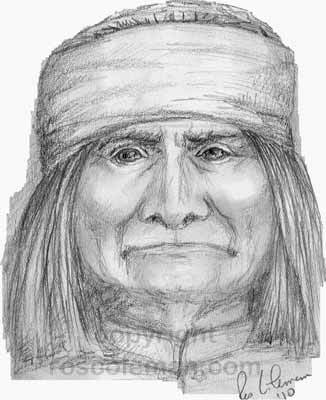 Native American Indian spirit guides seem to be drawn to people who are mediums, particularly in Spiritualist churches. Most of the Native American spirit guides I have painted have been for spiritualist mediums. The majority of people who are interested in mediums and their messages will attend their events and visit Spiritualist churches. It is natural that would appear that the majority of spirit guides are mediums to these people. Having said that, the majority of spirit guides I channel are not native American Indians. Are my Spirit Guides Unique to Me? All your spirit guides support you on a personal basis. Certain guides, relatives for example, or spouses, may support no one else, just you. At the Mind Body and Spirit Shows I worked at for several years, many healers sat with me for spirit guide paintings and readings. One particular guide, an Ascended Master who is known as a powerful healer, appeared (differently) in more than one of these paintings, and this was because the healers sitting with me channelled the healing and love from that Ascended Master as they worked with others. Angels and Ascended Masters, Gods and Goddesses, etc. have very powerful energies. This means they can guide or work through many people on an individual basis at once. 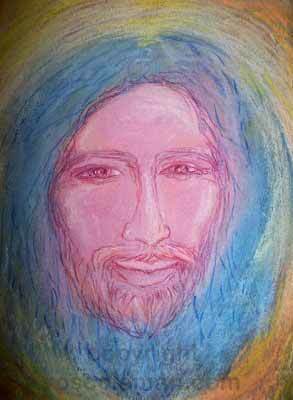 The Ascended Master I am talking about is Jesus. Over the years I did channel him for several people and every time there was some extraordinary twist or coincidence that meant everyone involved got something wonderful for free. You can read about in my e-book “Love from your Spirit Guides” which is FREE when you subscribe to my newsletter. Can Spirit Guides be Animals? Oh Yes! Both wild and domesticated animals can and do make wonderful spirit guides. Imagine the diversity of animal life on this planet! Every single species has evolved its own incredible set of skills and techniques for thriving in its natural environment. Each individual creature that has ever lived on Earth has developed personal expertise in its utilisation of these skills and found more of their own as well. Both an animal species, or the essence of that species (think cat, dog, eagle, bear, whale, etc) as well as an individual animal (a pet/companion animal or a wild creature) that has passed to Spirit can be a spirit guide. In these forms they have portrayed themselves as spirit guides in my paintings, making their skills, support and understanding available to the lucky sitter. How do Spirit Guides Help Us? As we walk our path through life, the Universe is constantly tuning in our thoughts, beliefs, desires and actions. The nature of universal law is that it reflects this back to us. This is what ‘manifestation’ is all about. Your spirit guides understand your purpose in this life and, like the universe, will also be listening, wanting to help you achieve your life purpose. Your spirit guides help you by drawing close to your energy field. This makes their skills and abilities, ideas, thoughts and communication available to you. An example of this was an experience I shared with a quiet young man I shall call Tom, at Gorton Monastery, a splendid spiritual building on the outskirts of Manchester, UK. Tom was silent throughout his entire sitting. As my spirit artist guide painted Tom’s spirit guide I observed, and let Tom’s guide explain his purpose with Tom. I saw a city at war. The city was divided in two, as each side sought to gain control of the other. Tom’s guide was highly intelligent. Yet I saw him dressing himself as a tramp and spilling the local hooch over his clothes. At night, he quietly crossed over into enemy territory and slumped at the foot of a stone wall, looking for all the world like a dirty pile of rags and reeking of alcohol. Two of the enemy guards were patrolling these walls. They stopped close to Tom’s guide, noting the tattered and inert bundle on the pathway. One aimed a kick at Tom’s guide, connecting with a thud, but he only elicited a drunken grunt followed by a loud snore. Laughing, the soldiers leant against the wall for a rest and started to talk. Our spirit guides also try to draw our attention to opportunities for us by giving us signals. These opportunities tend to be viewed as ‘coincidences’, and the signals can come in a variety of different ways. Our ability to pick up on these signals lies in how finely tuned are our own clear, or ‘clair’ senses and psychic awareness. It is of course our choice as to whether we opt to take the opportunity. Each of our guides will help us according to our own life purpose and according to where we are as individuals on our spiritual journey. Can a Spirit Guide be someone Living? Living people have come through in spirit guide portraits I’ve created (see image right) and also have done with other psychic artists. My intention is always for a “Spirit Guide” and I trust was I receive. Spirit certainly wanted the person painted. Perhaps a more accurate term here would be that they are a spiritual guide. 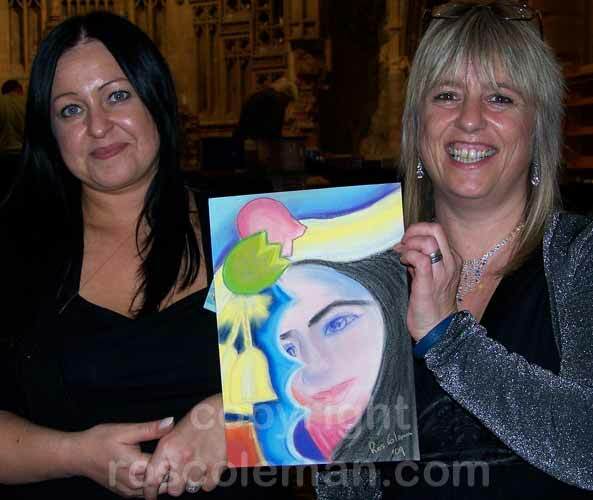 In this example, I painted this portrait for the lady on the right of the picture. The painting had a huge significance for her. Firstly on account of the symbology and strength of colour, which was meaningful to her. An hour after my friend had left, the second significance became clear. She returned with her new friend, with whom she had just started a business venture. The resemblance of her friend to the image in the painting is clear. And the friend (left) did play a significant part in her spiritual journey. This is a very rare occurrence and out of 1000’s of spirit guide channels, has only happened twice for me. How do Spirit Guides communicate with us? Signals and information received via our energy fields (aura, chakras and meridians). Via our own clear, or “clair-” senses. Often termed “sixth sense”, I think of them as “super-senses” and they involve sight, sound, feel and touch, empathy, smell and taste. These senses can be developed and can be employed to communicate with the animal kingdom as well as the Spirit world. Via other people, e.g. mediums, intuitives, psychics and artists of all kinds. been thinking about someone the split second before their email drops into your inbox, or they text or call you? received a sudden flash of (timely) inspiration that seemed to come out of nowhere? had a feeling in your gut that, without knowing why, something wasn’t quite right, only to have your suspicions confirmed at a later date? been seeking an answer to some problem or challenge and the answer appears out of the blue? Maybe a letter through your door; the words on a shop window sign catching your eye; a chance conversation overheard, or the sense of a ‘voice’ in your head? These are just a few examples of how your guides may get in touch with you. Everyone is different and no two people will communicate with their guides in the Spirit world in precisely the same way. But if there was some some strange coincidence or a feeling (yours) of surprise you can be pretty sure that your Spirit friends were involved. How can I send a Message to My Spirit Guide? Don’t worry. Your guides, your loved ones, your angels – everyone in the Spirit world who is close to you will be hearing you. They hear you via your thoughts, words, actions, feelings and emotions. They love you and are never far away.